That day I joined Second Life, created an avatar and started exploring this vast new world. Within 2 weeks, I had a little condo, became an art collector, started my own art gallery and had a wardrobe to die for. Today, I am a celebrated artist and have made a name for myself. Well, another name anyway. When I created my avatar, Gracie Kendal, I had no idea I would be looking so deeply into identity, both on a very personal level and publicly. At that time, I was suffocating in my life. I was working on my Master’s Degree, had a full time job, I was living with my parents to save money and hardly creating any art. My life changed the first time I logged into Second Life. How cool is it for people to actually get a second life? For those who have been residents of the amazing world of Second Life, whether for a few hours, weeks, months or many years… we ‘get it.’ We understand what it means to don a persona, an identity – a mask – and become someone else, either to explore another aspect of ourselves or find our true self. Avatars are amazing inventions. Just like Halloween, Carnival or masquerades, we can be brave, open and imaginative without judgement or criticism. One of the ideas behind the project was to capture the essence of the models. I wanted to show their humanity, energy and personality. Their character and attitude stood out so innocently, yet poignantly. I took a shot of both their front and back sides. My plan was to hang the portraits of their backs on the wall so they would remain anonymous. Their faces would be hidden. They would be unrecognizable. Are they men or women? Who are they? Does it matter? I have always believed that the avatar was a mask that we use to hide ourselves in order to truly show ourselves. While I was shooting your avatars, I saw so much life, so much humanity, so much reality – from smiles to gestures to dancing to hair and hats, to the smallest details of steampunk, dragons, and goth – I wanted to share this with everyone. Most people in the real world spend their lives in hiding. 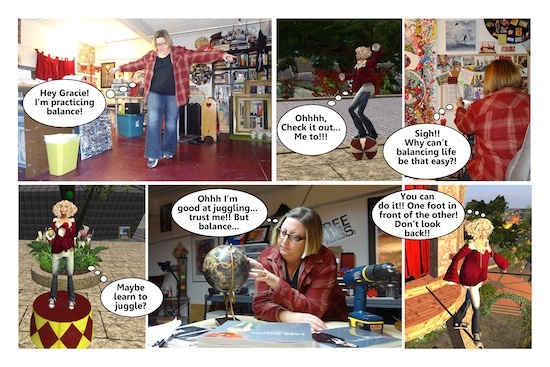 Hiding behind TV screens, reality shows, plastic surgery, diets, make-up – ‘staying in.’ Second Life allows us to come out. We can escape the bonds of everyday life and the mundane tasks that we dread and enslave us. We log into this amazing world full of hopes and dreams. I have met many people here with physical disabilities who log in and walk, swim, ‘talk’ and ‘hear.’ How wonderful is it that we can communicate with people all over the world through the easiest of translators. 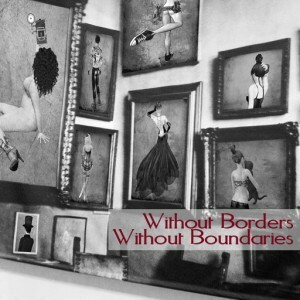 We can collaborate without borders or boundaries. I can’t wait to see the evolution of second life and its impact on society in the future. After shooting 2000 Avatar portraits, I published a 2 volume set of the avatars and I’m putting together a mixed-reality performance/installation that opens in May 2012 in Los Angeles. You can view a selection of portraits at www.1000avatars.wordpress.com. I have also created an indiegogo site to help raise money for my show. If you would like to become a patron of the arts and receive prints, a catalog and even an original painting for your contribution, check out my indiegogo site: http://www.indiegogo.com/And-one-man-in-his-time-plays-many-parts.